Chartres (1990 pop., 39,595) is the capital of Eure-et-Loir department in north central France, situated on the Eure River about 80 km (50 mi) southwest of Paris. It has many light industries and is a market center for the surrounding fertile plains of Beauce, but the city is more famous for its magnificent two-spired Gothic cathedral (built 1194-1225), one of the architectural masterpieces of the Middle Ages. Notre-Dame de Chartres (the Cathedral of Our Lady of Chartres), perhaps the supreme monument of High Gothic art and architecture, dominates the French town of Chartres. In no other Gothic church of comparable size is the architecture, sculpture, and stained glass so harmonious and of such quality, owing to the comparatively short (1194-1220) period of construction for the major parts of the edifice. The present church, the sixth on the site, was begun immediately after the fifth church burned in 1194. People of every rank helped rebuild the church, with labor or with lavish benefactions. The new cathedral, 134 m (440 ft) long, incorporated the transitional Gothic facade and the south tower, both survivors of the fire, preserving the splendid sculptured bays of the triple Royal Portal (1140-50) and the three stained-glass windows (c.1155) above. The rest of the cathedral was directly inspired by Abbé Suger's Abbey of Saint-Denis in Paris; the walls, piers, and flying buttresses became a skeletal framework supporting the soaring vaults and enormous windows. Inside, the unearthly radiance of the stained glass, particularly the glowing "Chartres blue," fills the entire church. The superbly proportioned Latin-cross plan includes a wide (16 m/52 ft) nave flanked by single 8-m (26-ft) aisles, a high (36 m/118 ft) vault, spacious (46 m/150 ft) transepts with side aisles, and an apsidal choir with double aisles and five radial chapels. 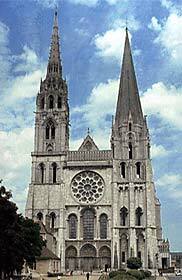 One of the great monuments of Europe, the cathedral is a UNESCO World Heritage Site. Sources: 2001 Grolier Multimedia Encyclopedia, © 2000 Grolier Interactive Inc. Chartres, Sanctuaire du Monde, a web site dedicated to the preservation of the Cathedral. Bibliography: Henry Adams, Mont Saint-Michel and Chartres (1913; repr. 1990); Robert Branner, ed., Chartres Cathedral (1969; repr. 1996); Titus Burckhardt, Chartres and the Birth of the Cathedral (1996); John James, Chartres: The Masons Who Built a Legend (1982); Meredith P. Lillich, The Stained Glass of Saint-Père de Chartres (1978). Images: Notre-Dame de Chartres (west façade), from Gothic Sculpture web site, maintained by Linda Neagley, Associate Professor of Art & Art History at Rice University, Houston, TX.